Many popular trails in Death Valley National Park follow side canyons, often quite narrow, and surrounded pretty, multi-colored, layered rocks. 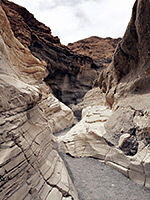 One short and easy walk is to the lower end of Mosaic Canyon, on the west side of Death Valley close to Stovepipe Wells. Just west of the village, a stony, 2.5 mile vehicle track heads towards the foothills of Tucki Mountain, ending at a parking area next to the opening of a (usually) dry wash that emerges from a deep ravine, framed by weathered cliffs that hereabouts rise quite sharply from the gently sloping valley floor. Mosaic is the easiest reached of Death Valley's narrow ravines, not as dramatic as others like nearby Grotto Canyon, but quite popular. 14 views of Mosaic Canyon. The streamway soon narrows to a channel just a few feet wide, winding through banded, marble-like rock mixed with colorful mosaic patches of agglomerated fragments, worn smooth by the countless floods that occasionally flow through the canyon as a result of storms in the mountains beyond. After a few hundred meters of narrow, twisting passageways the ravine turns to the south, opens out and becomes temporarily less interesting. The walk through this lower section takes only 15 minutes but the mosaic and marble formations are quite enchanting and well-worth a quick visit. The wash remains open for about half a mile, as the streamway gains height gradually and curves around a big bend to the right, enclosed by rugged, reddish brown rocks that rise high above on both sides. The floor is now stony and provides easy hiking, though with full exposure to the intense desert sun. A small side ravine joins from the left then the main canyon narrows again, to a section partially blocked by boulders though these can be climbed or bypassed on the left side without too much effort. Beyond are more quite nice passages that end at an angled dryfall of 20 feet which is also quite easy to climb, or again can be passed, by following a path to the right. The canyon is wider again for a while, but then just as another small branch joins from the right it enters a third section of shallow narrows, this time ending at a higher dryfall. The obstacle is much more difficult to climb and the best way to continue is to scramble up and across the steep, rather unstable hillside on the left side. From here, the drainage divides and both forks gain height more sharply with occasional sheer falls. All the narrow passageways have the same lovely marbelised rock, polished smooth and quite variable in color, and Mosaic Canyon is certainly easier to reach than the similar though rather more spectacular formations of Fall Canyon, 16 miles away in hills on the opposite side of the valley.